Perfect for any meeting or discussion, these easel pads are a great size to set on a table or a desk. Each easel comes with a two-sided cover that easily folds to become the base of the easel, allowing it to stand on its own. 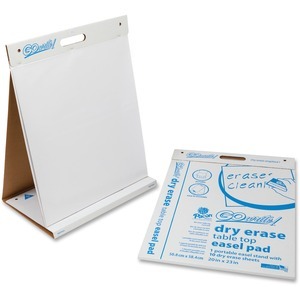 Wipe away, nonadhesive, dry-erase surface erases cleanly and is reusable. Each easel comes with a convenient carrying handle for easy transport.